Plot - Blue Spring Ride is a story of two young in which they lost contact when they separate and after time passes they meet again. 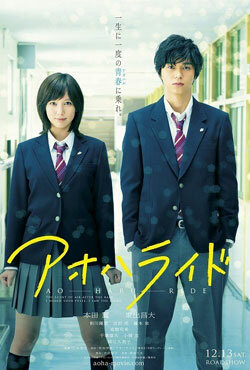 Futaba Yoshioka was a middle school student and likes Kou Tanaka who is different from other boy. Kou Tanaka moved away and they lost contact. She meet Kou Tanaka again when she is at the end of the first year as a high school student. He change his name from Kou Mabuchi and their is also a change in his personality from his middle school days. Box Office Earning of "Blue Spring Ride"